In the culinary arts, they say that presentation is as important as preparation. 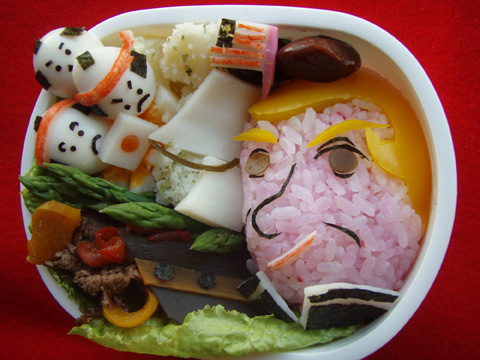 In Japan, it’s all about presentation when making character lunches. It is called “Kyaraben”, or “Charaben”, and goes beyond simply making the meal look appetizing. 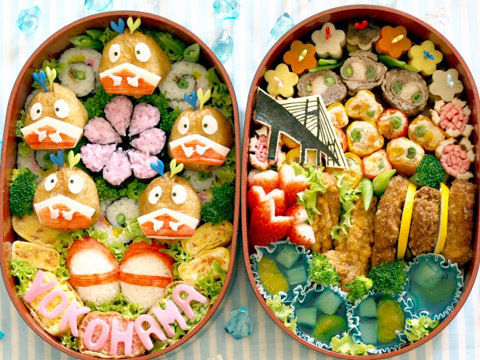 Most Kyaraben are made by mothers, who want to make their children’s lunches more appealing by arranging the contents of the Bento (lunch box) into their favorite cartoon characters or super heroes. The history of bento in Japan goes back some 900 years although the first boxes made for bento were the wooden lacquered boxes made during the late 16th century. Bento box lunches have been popular ever since, and there are thousands sold daily at train stations and aboard trains, but they aren’t nearly as artistic as Kyaraben. There are several contests for Kyaraben artists and their entries are quite imaginative and most importantly, edible. There is the Sanrio Kyaraben Contest and the Yokahama Kyaraben Contest, both won by the same person. Unfortunately for me, the winner’s blog is in Japanese and I can’t be sure I translated her name correctlyâ€¦I come up with Miho Chindonya. Of course, if I were talented enough to create one of these masterpieces, I’d probably smack the hand holding the hashi, (chopsticks) that was trying to steal a taste! exactly, they’re wayy too behind in the news..
Actually a mom with 4 kids help spread this fad by putting up her own blog in 2005 to which she uploaded photos of obentos she prepared almost everyday for her kids, just for fun. This lady is an excellent writer with a great sense of humour as well as a good artist. I think it helped increase the recognition among Japanese young moms and start the kyara-ben fad here. You can visit her site where she explains why and how she starded her own in English. BTW, I think we can trace back the roots of the Kyara-ben to Makunouchi-Bento which was served during the intermissions of performances at Kabuki theaters in mid-Edo era. it too nice looking to eat. y’know, that’s another thing. they look good. but do they *taste* good? Aw these are the cutest little bentos I’ve seen. What a great thing to do. I’m gonna move to Japan now. Miho is probably mom’s name and Nao her son or daughter. The last ‘chin’ is like chan which follows first name in casual conversations between friends or relatives. I guess -chan is commonly used while -chin has limited use. If you check her profile, a family name isn’t listed (that I saw). Like Show said, looks like it’s done by Miho mainly, w/ Nao in her username. The kanji you have there is “kyarabentou.” If you want “kyaraben,” then you need to take off the ending å½“ (tou). ã‚­ãƒ£ãƒ©ã‚¯ã‚¿ãƒ¼å¼å½“ is read as Kyaraktaa Bentou (Character Bento). It’s just that the Japanese always take the first syllables for actual usage. Just like Pasokon and other things. I wonder how long it takes to prepare one? It doesn’t look that appetizing but if my mom or girlfriend would prepare me that, I’d still eat it considering the effort it took to make one. Oh wow, now that is food art. Great ideas on this site!